Set on the water, a Battello wedding celebration makes for beautiful Jersey City Wedding Photography. The Battello is known for its breath-taking views of the New York city skyline, unique interior design, and contemporary menu. The highlight of the venue is the floor to ceiling windows that open onto a dock that overlooks boats that float on the Hudson River. The Jersey City Wedding Photography above shows the marina inspired decor seen inside the restaurant. In the top right corner of the photo, one can see a rowboat hanging upside down from the ceiling. This is just one of the salvaged and repurposed decorations that grace the interior of the building. The image also shows framed pieces of the New York and New Jersey shorelines along the Hudson. When placed together the pieces form one big picture, almost like a puzzle. At the center of the photograph is the star of the day, the bride. She is preparing to walk out of the venue and onto the dock for an outdoor wedding ceremony along the river. Traditionally the bride’s father escorts her down the aisle and “gives her away” to the groom. In this wedding ceremony, the grandmother of the bride has that honor. In the picture, the bride glances down at her grandmother, respect and adoration shining out of her face. 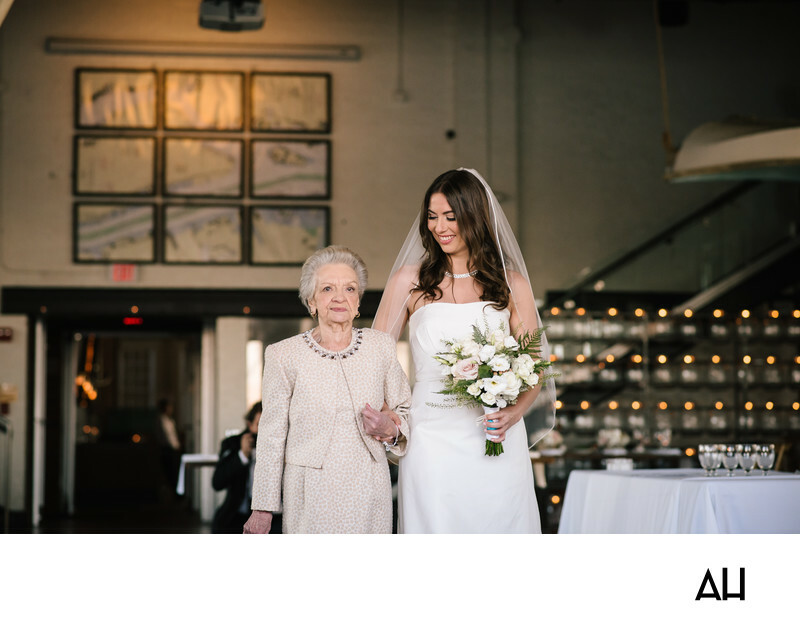 The bride towers over her grandmother now, as a grown woman, but once upon a time the the bride looked up to her quite literally. Her grandmother has always been a force to be reckoned with and a role model for the bride as she grew up. This quiet determination and pride shows in the grandmother’s expression, as she takes the arm of her granddaughter and the two women begin to walk.